ALL societies of insects are like overgrown families, for they have all originated from the egg of one female. Some experts have even called these families ‘super-organisms’ for, in one sense, they are like an organism, which needs all its parts to for healthy survival. Of them the honeybee is the most notable example in which division of labour is carried to an extreme and as a consequence, the hive may remain in existence for years. In these overgrown families, the queen lives for several seasons, but the other bees--- the males and remainder of the females and the infertile workers---are relatively short-lived. As many as 70,000 to 90,000 worker bees in a single flourishing hive are all the offspring of a single female, the queen bee. Honeybees are social bees of which there are four species – Apis mellifera, Apis indica, Apis dorsata and Apis florea or Apis cerana. They build combs of bee wax secreted by the worker bee and gather pollen and nectar. Their tongue is elongated and modified to reach down to the nectar source, deep inside the flowers. Their hind legs are hairy and they act as a brush for collecting pollen grains and also as a basket for transporting them back to the hive. Honeybees build hives in branches and tree hollows or rock ledges. 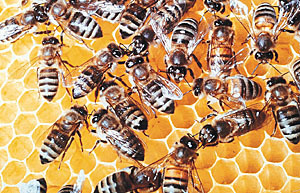 In a hive, there is a queen bee and a few sexually fertile males or drones and numerous sterile females or the common worker bees. It is the fertilised queen who starts the colony and lays a few eggs. After hatching, the larvae are fed on the queen’s saliva till the first workers emerge and completely relieve the queen of her duty of looking after the young and now she devotes herself solely to egg-laying. If we go by the age, after coming out of the cell a worker’s first task is to clean the cells from which other workers have recently emerged and prepare the cell for reuse by the queen for the purpose of egg-laying. After about three days, the same worker matures to feeding the larvae, in particular the older ones, and gathers pollen and honey from the stores. Her next duty, a few days later, is to feed the younger larvae and this she does by giving them, in addition to pollen and honey, a kind of milky food secreted from special glands in her head. At this stage, bees also begin to brave the open for the first time, making short reconnaissance flights. After the worker is about 10 days’ old, it takes on the jobs like packing pollen into cells, feeding the foraging bees with honey and building new cells with wax secreted from glands in the abdomen. When a worker bee is 20 days’ old, she takes on guard duties that involve inspecting every individual entering the hive. If anyone is not found to be possessing the hive-specific smell on its body, it is taken as an intruder and attacked. Finally, the day comes when it matures enough to be allowed to go out in search of food.